The Hospitallers and other great military-religious orders of the Crusade bred fierce religious soldiers. At dawn, June 23, 1565, on the island of Malta, headquarters and final stronghold of the Catholic military order of the “Knights of the Hospital of St. John the Baptist”—or as they have been known throughout Christendom, the Hospitallers—a seige by a Turkish expeditionary force under the Muslim general Mustapha Pasha was in its fifth week. The Turks were at the walls of the small fort of St. Elmo at the entrance to Grand Harbor. St. Elmo must be taken to gain the harbor itself and approaches to the larger Fort St. Angelo, the key to the island’s defenses. With the loss of their holdings in the Holy Lands during the 13th century the Hospitallers had retreated steadily westward across the Mediterranean, driven on by the Turko-Islamic tide. But now there would be no further retreats, for the Grand Master of the order, Fra. Jean de la Valette, was grimly determined that the fate of the Hospitallers would be decided at Malta. Despite continuous bombardment from land and sea and no hope of reinforcements, St. Elmo’s dwindling garrison had thrown back repeated assaults against the small fort. The end, however, could be seen at hand, for the morning light revealed a large section of the outer wall shattered by the concentration of Turkish siege guns. Having received communion at Mass before daybreak, the few remaining defenders took their positions at the walls. A final appeal to the garrison to surrender was refused, and trumpets signaled the Turkish attack. The gathered ranks of Islamic warriors had suffered terrible losses over the last weeks and vowed that this time they would breach the walls and avenge their dead. Exhorted on the Imams, a human wave rolled forward as guns aboard the Turkish galleys pounded the small fort’s crumbling defenses. In the van of the attacking hosts were hashish-maddened Dervishes followed by crack Spahis levies. Behind the Spahis advanced the flower of Islamic arms under the horsetail-crescent banner of the Sultan Suliman—the legendary Janissaries. The archers and few remaining guns in the fort lashed the advancing Turkish ranks that trampled their own wounded and dying in their fury to reach the Unbelievers. The Faithful clambered up the wall over broken bodies and shattered masonry to be met in the breach by a handful of armored men in scarlet surcoats with white crosses. The faint cries of “Beau-Saint, Beau-Jean!” were drowned amid the din of Islamic drums and appeals to Allah. Soon it was over; of the defenders only a few severely wounded remained to be taken as hostages. The knights who fought with such desperate courage on Malta represent one of the most intriguing phenomena in European history. Throughout the crusading era and its aftermath the Order of the Hospital and its tragically short-lived rival, the Order of the Temple, waged relentless warfare against all enemies of the Catholic Church, real or imagined. Part monk and part warrior, these “Soldiers of Christ” saw themselves as consecrated defenders of the True Faith—dedicated to humble piety in cloister and absolute ferocity in battle. “A new knighthood has appeared on earth, a knighthood which wages a double war against the adversaries of flesh and blood in this world and against the spiritual forces of evil in the other.” So wrote Bernard de Clairvaux, Cistercian monk and future saint, in a letter to the Vatican promoting the Templars, quoted in The Knights Templar. Bernard’s excerpt illustrates the conceptual paradox of military-religious orders. Like their opponents of the Koran, these men held a most violent interpretation of paradise, for they tried, literally, to fight their way into heaven. The origins of the military orders can be traced to classical antiquity and Constantine’s victory at the Milvian Bridge. The blending of Christianity with the influence of Nordic/Teutonic militarism created the ideological basis of European knighthood. This synthesis of martial prowess and religious piety eventually evolved into a code of chivalry that governed a knight’s behavior within medieval society, and most specifically his conduct in battle. A knight was required to show mercy and compassion to a vanquished foe, but chivalry was reserved only for those whom the upper class deemed worthy, that is, other knights. 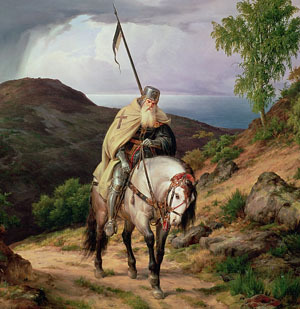 Thus peasants of any nationality, Jews, Eastern Orthodox believers and of course, Muslims were rarely accorded the largess of chivalry and were frequently slaughtered during medieval military excursions. Strengthened by the Cluniac reforms of the 11th century, the Catholic Church was concerned by the internecine fighting of the knights-militant. The Truce of God of 1040 was an attempt by Papal decree to stem warfare. It forbade fighting on holy days, but it met with little success in curbing medieval bloodshed. Something was needed that could divert the militant energies of the knights into activities more in accord with church doctrine. In 1095 Pope Urban II’s inspired rhetoric seemed to provide an answer as thousands flocked to join the first of the great Christian crusades to the Holy Lands. Among those who took up the cross that year were a number of young knights who would establish the first of the great military orders in the East. The late Arnold Toynbee once referred to the crusades as “Christianized Viking expeditions,” and given the wanton destruction and killing that accompanied these Frankish invasions of Palestine, his description seems appropriate. But the crusades provided Western Christianity with its greatest inspirational prize and portended the rise of the military orders by giving an aggressive medieval nobility a spiritual and military raison d’être. The foe had clearly been defined. Whatever one’s qualms concerning the slaying of heretics or schismatics of a common culture, the destruction of Islamic heathen could be carried out with complete spiritual aplomb. “O mighty soldier, O man of war, you now have a cause for which you can fight without endangering your soul … a cause in which to win is glorious and for which to die is but gain” ran one saying. According to the legend, among those who perished with Charlemagne’s rear guard at Roncesvalles was Roland’s faithful comrade, the Archbishop Turpin. Here is an early, albeit apocryphal, depiction of the clergy bearing swords—the ideological antecedent to the military orders. Over the past centuries the Papacy had approved the creation of a number of Catholic Orders, societies of holy men dedicated to caring for the sick and teaching the masses. Now there was a need for another kind of society, an order of holy men dedicated to war. The establishment of the Latin Kingdoms in Palestine was a remarkable military achievement, but maintaining their existence proved to be a formidable task. Aside from the jealousy and infighting among the vassal lords who governed the Latin territories, which usually precluded any effective leadership, the main problem in the Outremer, or “Land Beyond the Sea” as it was called by the Franks, was a chronic shortage of military manpower. The Christian states were never more than small islands in an Islamic sea, continually under pressure from Moslem encroachment. There was also the problem of protecting the many Christian pilgrims who thronged the roads between Jerusalem and Antioch. Unfortunately for the church, after the initial fervor of conquest wore off, the harsh environment of Palestine offered little inducement for successive crusaders to remain. What was needed was a reliable force of men-at-arms totally dedicated to the protection and preservation of the Holy Lands. According to tradition it was in 1115 that Hugh de Payens, cousin of Bernard of Clairvaux and one of the early crusaders, organized a small group of knights to defend pilgrims on the road to Jerusalem. Each volunteer was required to take the triple vows of poverty, chastity, and obedience and had sworn to wage war against the “Enemies of Christ” whenever and wherever they were found. The dedication of this small band soon caught the attention of King Baldwin I of Palestine, and in 1118 he gave them official residence in the Royal Palace at Jerusalem. Their rooms were traditionally thought to be above the Temple of Solomon, hence the “Society of Poor Knights of Christ of the Temple of Solomon” as they called themselves, more popularly, the Templars. The order received official sanction at the Council of Troyes in 1128, and soon monetary donations and pledges of real estate began to pour in as the order’s reputation for piety and prowess in battle spread. In 1139 Pope Innocent II issued a Papal bull guaranteeing the Templars their independence from the authority of bishops and kings, and the order eventually became a law unto itself, accountable only to the Pope. During the mid-12th century another order arose which would rival and eventually supercede the Templars. The Poor Knights of the Hospital of St. John trace their origin to a pilgrim way station in Jerusalem that had been operated by Benedictine monks before the crusades. Brother Gerard, a humble monk who devoted his life to the care of the sick and poor, established the order early in the 12th century. In 1120 Gerard died and was succeeded by Raymond de Puy. It was de Puy who began the order’s transformation from its purely charitable role to one of a more militant nature. By the latter half of the 12th century the Hospitallers had become as wealthy and prestigious as the Templars, establishing castles and strongholds throughout the Latin Kingdoms as well as Europe. Although the Hospitallers owed a great deal of their organization and military structure to their rivals, unlike the Templars, which became exclusively a military order, the Hospitallers never lost sight of their humble origins and always maintained infirmaries and guest houses for pilgrims near their military installations. Like their unarmed counterparts, the Benedictines and Cistercians, the rules and organization of the military orders was intended to enforce a tightly structured community. Both of the orders operated under a rigid hierarchy of elected officials, with the Grand Master as the titular head who held immense, though not absolute, power. The Senschal was the executive officer, followed in precedence by the Grand Marshal, who was responsible for military affairs. The Commanders of the Temple and Hospital resided at Jerusalem and Acre, respectively, and was the chief financial officers of their orders. The commander worked closely with the Draper, a position analogous to a quartermaster, who oversaw the logistics and maintenance of the order’s various preceptories, fortresses and estates. A group of senior knights formed the General Chapter, which assisted the Grand Master in addressing important affairs and had the power, if necessary, to override his decisions. As the orders expanded their overseas holdings, provincial masters were chosen whose main concern was to increase the orders’ holdings and influence in Europe, thereby ensuring a steady flow of income and recruitment to the fighting units in the East. All details of the brethren’s social, religious and military life was regulated by the Fraternal Rule. Meals were to be eaten in complete silence and ornate decor in clothing or battle raiment was forbidden. Any activity outside a martial or religious context was seen as frivolous and inappropriate, thus chess, the raising of hounds and hunting were seen as distracting secular pastimes, prideful and unbecoming of a Knight of Christ. Weapon practice, including mock combat, was conducted daily, but jousting and tournaments were forbidden. As for women, they were “perilous things,” creatures of passion and temptation to be unequivocally avoided. Asceticism and conformity were also reflected in the appearance of the military brethren. Although hair was kept closely shorn, a full beard demonstrated humility and a simple brown or white habit sufficed for personal dress. In battle, however, the Templars wore a white surcoat emblazoned with a red cross reminiscent of the early crusaders while the Hospitallers began with a black tunic but eventually adopted a scarlet supravest with a white eight-armed cross to be worn over their armor. Personal property beyond the necessary military accouterments was severely frowned upon. Be it a small donation or the pledge of an entire estate, a gift to a Templar or Hospitaller became a gift to the order; thus, while the brethren lived in relative austerity, the orders became increasingly wealthy. Much of this wealth was transferred east to the Holy Lands where vast sums of money were needed to support the fortresses and installations occupied by the orders. While both orders received a great deal of income via pledges and contributions, the Templars sought to supplement their resources by other means. The church was concerned over the evils of money lending, but the Templars declared themselves exempt from Papal sanctions against usury as the ordained defenders of the Holy Lands. By the middle of the 13th century the Templars had built a vast financial empire in Europe and the Latin Kingdoms as creditors to numerous heads of state. Rumors of their immense wealth became widespread, which would lead to tragic consequences in the future. From the capture of Jerusalem in 1099 to the fall of Acre in 1291, the Christian states in Palestine managed to survive almost two hundred years. Given the circumstances, this was a most remarkable feat. Support from Europe was thousands of miles away and unity or cooperation between the Frankish rulers was extremely rare. Religious intolerance and inept leadership usually eroded any opportunity for peaceful coexistence with the surrounding Moslem powers. The only factor that favored the Christians was the divisive nature of the House of Islam. When the Moslem states became united under a charismatic leader like Saladin or Baibars, the fortunes of the Latin Kingdoms swiftly declined. Through it all the Templars and Hospitallers fought on, and as they were often the only standing military forces in Palestine, a great deal of credit for the longevity of the Christian states must rest with them. But in the long run the task was too great and their numbers too few, for even at the height of their power and with the fortress garrisons stripped to absolute minimums, the orders combined could rarely put more than a thousand armed knights in the field. Despite their usual uncompromising hostility toward Islam, the Templars and Hospitallers occasionally negotiated with their enemies, even aligning themselves with rival Islamic factions. The bitter hatred between the crescent and cross, however, precluded any lengthy rapprochement. It was more often guerre `a l’outrance—war without quarter. Should a secular knight be captured in battle he could hope for ransom; for the “bearded fiends of Hell,” as the military orders had been described by a Mameluke, capture almost assured execution. Indeed, one cruelly innovative sultan greatly enjoyed using captured Templars for archery practice. When ably led, the heavy cavalry of the military orders presented a formidable force and their presence was influential in a number of Christian victories in Palestine. In 1177 it was recorded that 80 Templars and several hundred other knights under the brave but leprosy-stricken Baldwin IV routed Saladin’s army of 12,000 outside Jerusalem with a dramatic charge. The knights of the Temple and Hospital also played a major role in Richard Coeur de Lion’s triumphs at the battles of Arsuf and Jaffa during the Third Crusade. But the fierce pride and reckless courage of the orders could also lead to disaster. In 1187 Gerard de Ridefort became Grand Master of the Temple and with a group of 90 Templars and 40 Hospitallers rashly attacked a large Moslem raiding column. Heavily outnumbered, the Christians were completely destroyed. Ironically, one of the three survivors was the foolhardy Gerard. Several months later the same de Ridefort led a large contingent of Templars and Hospitallers into another disaster. This time the knights of the military orders were part of a Christian force sent to relieve a castle in Galilee that Saladin had taken under siege. But the Frankish force was surprised by Saladin’s larger army at the Horns of Hattin near Lake Tiberias and cut to pieces [see Military Heritage, December 1999]. Of the six hundred knights fielded by the two military orders, more than five hundred perished at Hattin, and it took decades for the losses in manpower to be recovered. The last 50 years of Christian Palestine were marked by civil disorder and increasing pressure by the forces of Islam. Mongol invasions in Persia and Arabia gave Palestine a brief respite and, ironically enough, produced an attempt at military cooperation between the Franks and Syrian Moslems against the savage Khwarismian Turks hired by the Sultan of Cairo. The battle at Gaza in 1244, however, ended in disaster for the would-be allies, and when Baibars’ Mamelukes destroyed the Mongols in Syria, the fate of Christian Palestine was sealed. While Frankish barons squabbled over their shrinking domains and held opulent festivals in the coastal cities, one by one the outlying fortresses fell. Despite fierce resistance, the military orders lost their greatest strongholds—the Templar fortress at Safed in 1268 and the Hospitaller’s magnificent castle in Syria, the Krak-des-Chevaliers, in 1271. It was during these last years of agony and disaster that the military orders redeemed themselves for their bickering and political meddling. As the Christian populace fled to the dwindling strongholds and cities it was usually the knights of the Hospital or Temple who fought the desperate rearguard actions. Never had the orders shown more valor or devotion to duty, but the 11th hour was at hand. The final act was played out in the coastal fortress of Acre. In May of 1291 the Sultan al-Ashraf Khalil surrounded the city with the greatest army ever seen in the Mediterranean, estimated by contemporary chroniclers at over 100,000 men. While medieval observers may have exaggerated the numbers, there seems no question that it was the largest Moslem force ever gathered in the Levant. Every available man was gathered for the defense of the city, and it was perhaps appropriate that all of the military orders in the dying Palestine were represented. Besides the Templars and Hospitallers, there were small contingents of the Teutonic Knights, who would later carve an empire in the wilds of eastern Prussia, and the tragic order of armed lepers, the Knights of St. Lazarus. But they were far too few. Including some secular knights from Cyprus and a group of Italian mercenaries the defenders of Acre could muster barely 15,000 men. By May 15 the first of the city’s great walls had begun to crumble under continuous bombardment by the Sultan’s huge siege mangonels and catapults. The defenders were forced to retreat to the inner walls, husbanding their dwindling numbers to meet the incessant Saracen attacks. On the 18th, al-Ashraf ordered a general assault on the inner towers and the final phase of the battle began. Led by the military brethren in red and white, the defenders held off wave after wave of Mameluke suicide attacks, but in spite of all efforts the inner defenses were overwhelmed. All of the traditional animosity between the two great orders was cast aside during the final hours. The Master of the Temple, Fra. Jean Beaujeu, died fighting beside his Hospitaller counterpart, Fra. Jean de Villiers. De Villiers, severe0ly wounded, was dragged weeping and protesting to a ship in the harbor. The Templars put as many civilians as possible aboard the order’s galleys and prepared to defend the last stronghold of the city, the Temple of Acre. On May 28 a wall of the Temple was undermined by sappers, and two thousand Mameluke shock troops were thrown into the gap. But the weakened walls could not support the structure and the fortress collapsed, burying the brethren and their enemies in a common tomb. The fall of Acre sent shock waves throughout Europe and proved a devastating blow to the military orders. Their inspiration and reason for being was now lost forever. The fall of Christian Palestine was a harsh blow for both of the military orders, although the Hospitallers had their charitable activities to fall back upon and eventually found other avenues to oppose Islam. Hospital brethren fought alongside the Spanish military orders during the Reconquista and the order became a “thorn in the side” of the Turkish beys with daring naval raids in the eastern Mediterranean. Thrice besieged at the island of Rhodes and finally driven to Malta, the order fought its most celebrated battle in the Great Siege of 1565. But by the time Napoleon’s expeditionary force bound for Egypt arrived off Malta in 1798 the order had declined militarily, and after a token resistance to the French, the Hospitallers surrendered one of the strongest fortresses in the Mediterranean. The brethren endured, and The Order of the Hospital remains today as an international confraternity that provides medical assistance in underdeveloped nations. Its 8,500 members also proudly wear the badge of the eight-armed cross, a last tangible link to the passion and glory of the crusades. In the end it was the Hospitallers’ charitable activities that saved them from the grim fate which befell the Templars. Defending the Holy Lands had been the Templars only reason for existence, and although they had accumulated vast holdings in Europe they could never accept the fact that Palestine was no longer their domain. Several ineffective raids were mounted from Cyprus that only seemed to emphasize the futility of attempting to regain the lost kingdoms. Support from Europe dwindled as the Templars’ Western preceptories were reluctant to throw valuable resources into such hopeless endeavors—Temple funds could be more profitably utilized in financing the nationalistic endeavors of European leaders. The Temple preceptory in France, for example, became the royal depository for the Capetian monarchs. The Templars were exempt from taxation, exempt from sanctions against usury and exempt from royal patronage. Their autonomy and wealth, however, became increasingly intolerable to a number of European monarchs. Irritated with Templar meddling in political affairs and jealous of their vast holdings, Henry II of England threatened the order with confiscation of a number of bequeathed states. “You Templars have so many liberties and possessions that you rave with pride and haughtiness. What was imprudently given can be prudently revoked,” he reportedly said. Henry’s response to this insubordination was not recorded, but he was not the only monarch to resent the status of the Templars. For example, even as he signed a writ guaranteeing the perpetuity of Templar estates in France, Philip IV was quietly planning their destruction. Envious of their wealth, the Capetian king also saw the Templars as a hurdle to his grandiose plan of becoming the military-religious leader of greater Europe. A man of Machiavellian nature, Philip sought and eventually gained control over the Papacy in Rome. With this last avenue of support for the military order neutralized, Philip struck, and in 1307 he ordered the arrest of every Templar in his realm, including the Grand Master who was in France on a visit from Cyprus. Over the next seven years thousands of Templars were imprisoned and tortured for alleged crimes of idolatry and sexual perversions. Those who refused or recanted their confessions were subsequently burned at the stake. In 1314 the Order of the Temple was officially dissolved by Papal decree and most of the Templar holdings in Europe were given to the Hospitallers. The rivalry between the two great military orders was finally over. In a final reflection on the Templars and Hospitallers, one question remains: Why did these men, many of them of noble birth and wealth, give up the amenities of their class to enter a vocation so extremely harsh and ascetic even by medieval standards? Perhaps they were only products of their age, for it must be remembered that the orders offered security in a world rent with dissension and chaos. Although the lifestyle was harsh, a brother was guaranteed food, lodging, comradeship and, most significant in respect to the era, spiritual fulfillment. Only within the orders could a knight wage war as he had been prepared for from birth within the secular world and receive religious sanctification for his efforts. Then too, the structure of the orders found a role for all who entered, whether combatant, domestic or financier. Finally, the orders offered social mobility, for a knight could, if fortune prevailed, rise to command one of the most powerful institutions in Christendom. Thus, in an age of piety and ignorance, the military orders offered much to those willing to surrender their personal freedoms, and many accepted. But centuries passed, and with the evolution of time the orders whose blood and passion had been admired as the essence of the crusading spirit were being viewed as anachronistic institutions by the Renaissance. The ideological challenges of the Reformation demanded a different caliber of religious warrior, one whose weapons were doctrine and dogma rather than sword and lance. Thus it was for Ignatius Loyola and his Jesuit missionaries to advance the new standards of Catholicism. Tags Catholic Church, Crusades, Fort St. Angelo, Fort St. Elmo, Hugh de Payens, Islam, Janissaries, Jean de la Valette, Jerusalem, Knights Hospitallers of the Order of St. John, knights templar, Malta, Muslim, Mustapha Pasha, Palestine, Teutonic Knights.